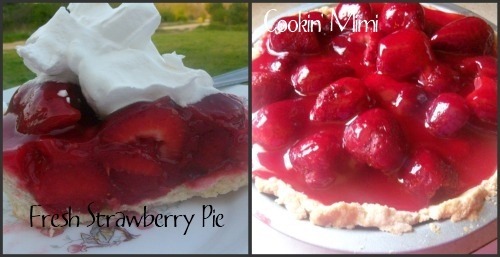 Absolutely perfect for this time of year, fresh strawberry pie is one thing I look forward to every spring and summer. You can even use a store bought cookie crust for a no bake dessert. Visit Cookin’ for My Captain to link up and as soon as I get the code I will add it here. Thanks for hanging in there without the code while I was on vacation. I sent you an email today with the codes for the next 2 weeks. I also “featured” the jelly recipe on the next FBF post. =) Have a great week!